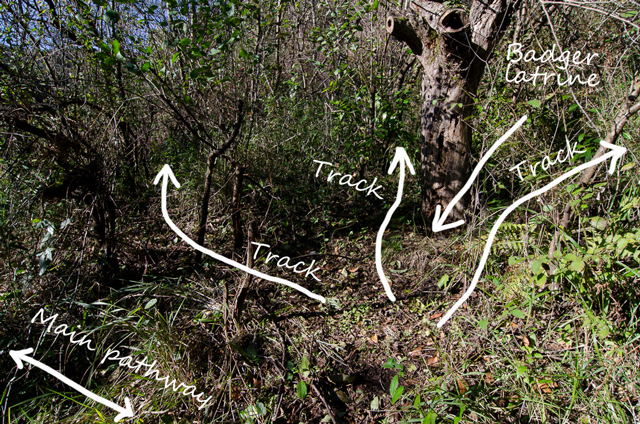 Animals frequently use the same paths and tracks to move around their environment. It could be a route towards a water source or a preferred track for entering a den, sett or resting place. We’ve been fortunate to have access to an area with a well established path. Although situated close to a village, it’s positioned near a mountain and woodland area. Badgers have been seen all through the summer, feeding on the fruit from figs trees. It’s an ideal location to prepare a longer term project. So, the goal was to record the species that regularly share the same pathway and try to obtain some interesting video clips. Even during the summer months and through the thick undergrowth we could spot potential paths. 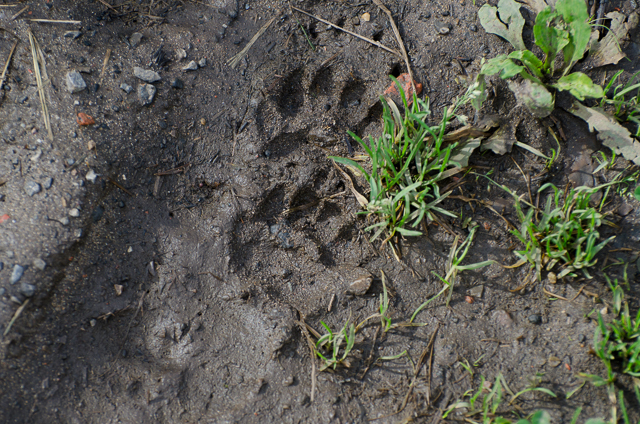 We also discovered badger prints close by, a promising sign. 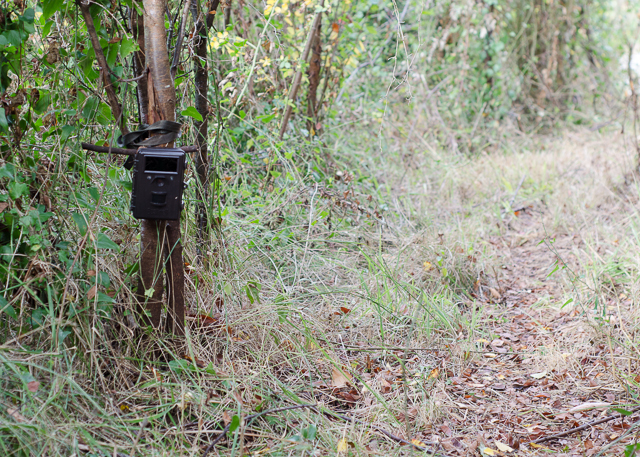 We placed a trail camera on what appeared to be a junction point, just off the main pathway. The tree stump became a badger’s latrine for a period in the summer, easily identified with partly digested figs. And there are at least 3 well defined tracks converging to this point (photo above) so, it offered good opportunity. And the results. We managed to record a huge amount of badger clips, at least 2 individuals with strict routines, sometimes triggering the camera within a few minutes each night. Personal highlights were the pine martens. 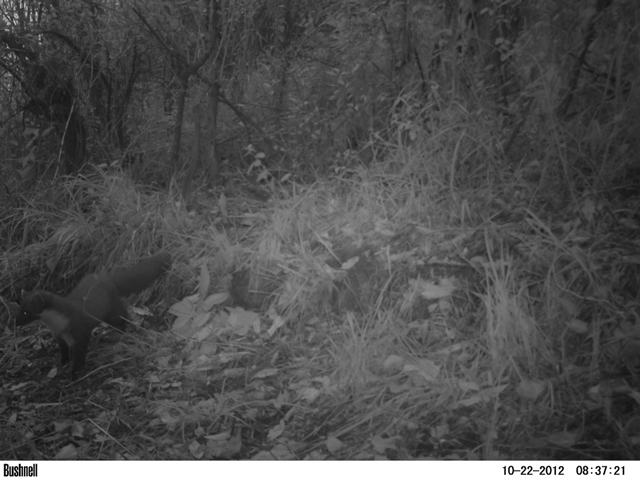 We believe there are at least 3 individuals – (1 recorded has no tail). The still below taken in ‘photo mode’. This mode produced mixed results, especially with smaller quick moving animals, they often appeared blurred or half in the frame, a faster shutter speed needed. The foxes are always busy and the genet although appears briefly, is always something special. Awesome post, mate! It can be inspiring to other people getting familiar with trail camera techniques. Please keep up the good work. Cheers. Thanks for the shots. I have never realised that so many animals crossed a point like this. Even during day time is there rather busy. Wonderful camera technique. Please keep up the good work. Regards, Leo. That is wonderful footage! You picked the perfect spot along the trail, didn’t you. I didn’t even know there were pine martens in Spain. They’re one of my favourite animals. Thanks for your comments. It’s an exciting project and we really enjoy it. Hopefully there will be more to show you soon. Pine Martens part II looks promising. Cheers, John.